A gaggle of Hanna-Barbera's favorite cartoon characters participate in track and field competition, spoofing ABC's "Wide World of Sports." Other cartoon segments included new episodes of "Dynomutt, Dog Wonder," "Captain Caveman and His Teen Angels," and "Scooby-Doo". This page has been viewed 3 times this month, and 8,831 times total. 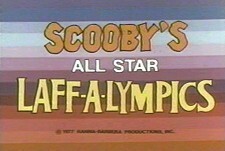 Scooby's All-Star Laff-A-Lympics Episode Guide -Hanna-Barbera by Big Cartoon DataBase is licensed under a Creative Commons Attribution-NonCommercial-ShareAlike 4.0 International License.